Even though I’ve been buried so deeply in work that I can barely breathe, I stole some free hours to read this book. Correction: nearly devour. Even though the authors employ an annoying strategy of drawing out the slow, chronological progress (so that hours sometime read as if they were days and the actual days of story’s timeline read even longer), The Siege of Washington remains a good history, superbly grounded in both historical research and engaging narrative. I’m not that much of an American Civil War buff. Most American history leaves me yawning: likely a result of over-exposure in my childhood and youth. But this narrowly defined topic was entirely new to me: the history of Washington’s perilous experience between the fall of Fort Sumter and the arrival of volunteer troops sufficient to defend the capital, all within a few days in April, 1861. The authors, John and Charles Lockwood, paint a picture of the divided city and its people at Lincoln’s inauguration. The juxtaposition of disgruntled supporters of the Confederacy with eager suppliants to the new Lincoln White House makes for an interesting backdrop. This crisis creeps up almost unseen on a city in the midst of transition from one presidency to another, given the wealth of patronage appointments. 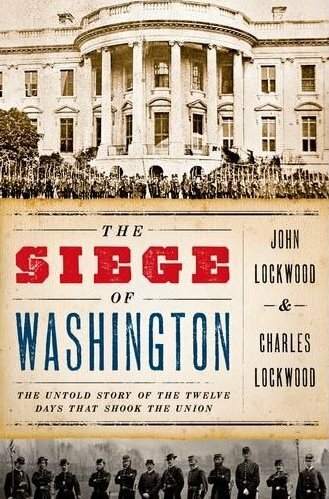 The Lockwoods do a good job of setting 1861 Washington into a broader context of regional politics and economics. I’ll never look at Baltimore the same way after reading about its “Mob City” moniker and the ways in which its citizens reacted to the passage through of Union volunteer troops. The first battle may have come some months later, but the first deaths of the war occurred right there with troops attacked by townspeople. The book is overflowing with delicious anecdotes, from the surly troops in the Capitol who were bayoneting Jeff Davis’s desk (until chided for destroying government property) to the story of Clara Barton’s life as a government clerk before she founded the Red Cross when she saw the need in the injured volunteers from her home state of Massachusetts. The newspaper reports and eyewitness accounts give the history a lively sense of urgency and depth. The only annoying part of The Siege of Washington was the authors’ conceit that Washington would possibly, maybe, oh-wait-and-keep-reading! fall. I knew enough of the history to know that was a non-starter and I expect almost every reader will be similarly unsurprised. That said, their final chapter, tackling the variety of “what ifs” and “if only”s put forward by contemporaries at the time or soon after makes for fascinating historical reading. To see how people of the time recognized this as a key moment in their history was a clincher for me and something I expect others would equally enjoy. The title of the post made me think this would be about some current political situation! I don’t think I was over-exposed to the American Civil War in school, so I’m not sure why I don’t get interested in it. Maybe because I have trouble getting interested in US history in general, except for California (I keep thinking I should have been a historian of California, and then no matter where I had a job I could spend summers in the Bancroft Library—“too soon old, too late smart” department). But I recently tried to explain something about our Civil War to a Brit and realized there are a lot of phrases/names I know but I don’t have a good grasp of the actual issues associated with them; made me feel I should figure out some of this stuff. It’s a great book to read in light of the past three years of Washington news, I admit. The crises that the politicians trumpet seem far less worrisome than the prospect of an army crossing the Potomac! The history of California? Now there’s an idea! I’d be up for anything that could get me in spitting distance of the Huntington Library a bit more often.